Gulf Coast residents hit by flash floods will have to deal with yet more rainfall Friday before they can begin the arduous cleanup operation in their communities. Southern areas of Louisiana have been battered by around a foot of rainfall, leaving at least one dead, causing roads to turn to rivers, and uprooting caskets from their graves. Some places could endure another three inches of rain Friday - and the storm may not dry out until as late as Sunday, according to Michael Palmer, lead forecaster at The Weather Channel. "They are going to get a fairly similar dose to what's been happening in the past couple of days," Palmer told NBC News Friday morning. "This system is not moving at all at the moment." 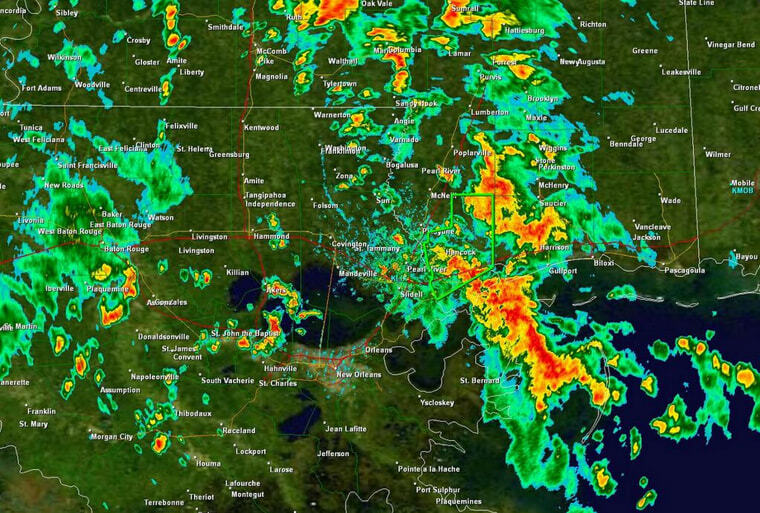 The National Weather Service issued flash flood warnings for an area of southeast Louisiana including Baton Rouge and New Orleans. The heavy rainfall began on Wednesday morning and dozens of houses have been flooded. In Assumption Parish, one of the worst affected areas, around a dozen caskets floated from their graves on Wednesday. Palmer said is not the first time flash floods have caused this macabre sight; in some parts of Louisiana bodies cannot be buried in conventional, deeper graves because of the high water table. Cindy Earl Williams told the Baton Rouge Advocate that she was waiting to re-bury her mother after her casket came lose in the parish's town of Belle Rose. "This is sad," she told the newspaper, adding that it felt like she was preparing for another funeral, just three years after her mother died. Many people took to Twitter and Facebook to post videos of cars driving through flooded roads. But Palmer urged caution: "The main danger with the flooding is people attempting to drive through the water. "You do not know how fast the water is flowing and it does not take much water to turn around a car," he added. "Our advice is, 'Turn around, don't drown.'"